King's Chapel looks like one of the least-interesting Freedom Trail sites from the outside, and you may feel tempted to pass it by. 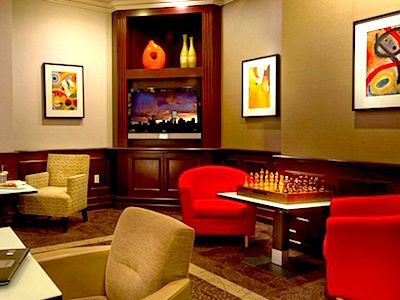 In addition to having an elegant interior and a history that encapsulates a century of tensions between British rules and Colonists, the classical Georgian-style stone and granite building with Greek-style columns hosts excellent concerts, including concerts every Tuesday that you can attend for less than a drink at Starbucks. Inside, the chapel is quite beautiful, and well worth a 10-minute visit. 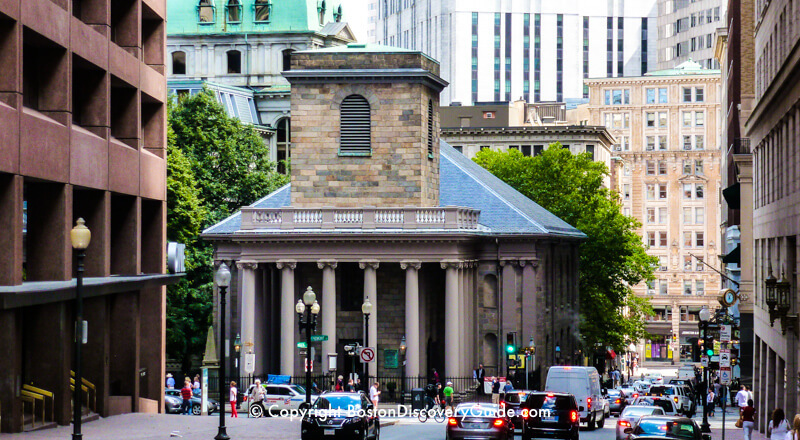 If you are in this part of Boston on a Tuesday, plan your visit to coincide with the weekly noon concert, featuring an eclectic range of music including occasionally the chapel's own magnificent organ. Like several other Freedom Trail sites, King's Chapel is still an active church, home to a vibrant Unitarian congregation. King's Chapel's world-renowned music program fills an important position in Boston's rich music landscape, partly because of its magnificent C.B. Fisk organ, the Chapel's 6th and a copy of the 1756 organ. The late Music Director Daniel Pinkham earned star status in Boston's Early Music community. King's Chapel also belongs to the famed Boston Choral Consortium. However, the Chapel is open for self-guided tours on weekdays (Monday - Friday). Information available onsite informs you about the Chapel's history, architecture, and treasures. A small donation is requested, although not required, to help support on-going maintenance related to the wear and tear of tourist traffic. Tuesday Noon Concerts: These 30-40 minute performances take place throughout the year. 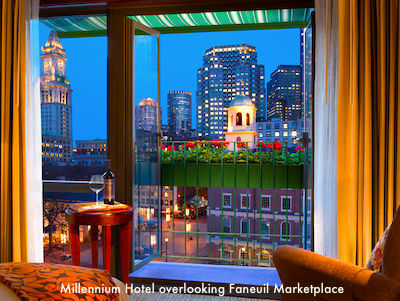 See the Boston Event Calendar for February for details. A small donation is requested. Sunday service: You are welcome to attend a Sunday service, during which you'll get to hear the beautiful organ and the famed King's Chapel Choir. 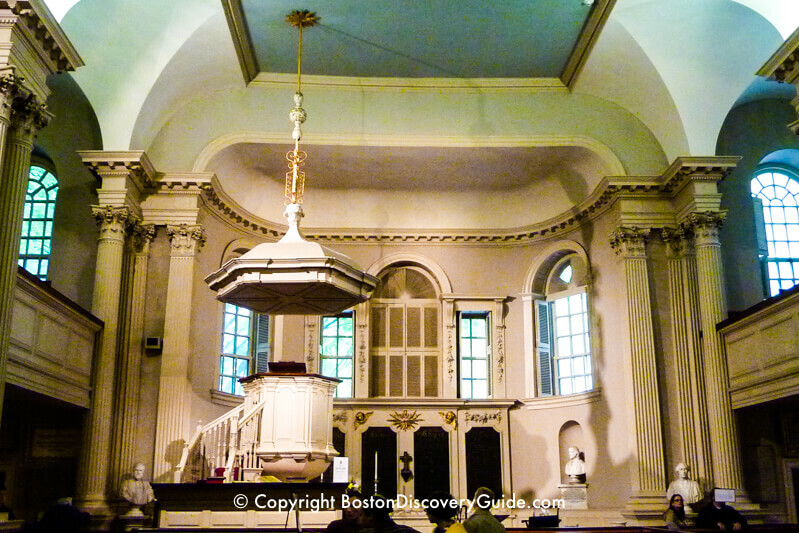 Many Freedom Trail Tours pass by King's Chapel and provide interesting commentary, but do not include a visit inside. However, you can easily go inside on your own. 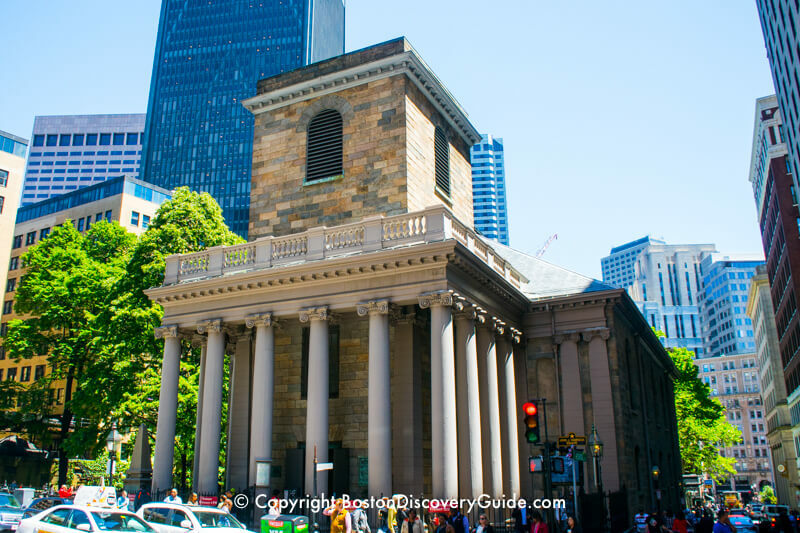 Puritans did not want churches in Boston - so King's Chapel, originally an Anglican church, had a bumpy beginning. Boston's Puritan founders fled England in fear of their lives due to religious persecution by the Anglican king, head of the Church of England. However, the Puritans showed no more tolerance than their persecutors. Not surprisingly, Anglican religious services were banned in Boston. Although the Puritans did build places of worship - they called them "meeting houses" - they designed them to be as unlike Anglican churches as possible: simple, unadorned, steeple-less. But not everyone in Boston was a Puritan. In particular, most Royalists - often appointees of the English king - were Anglicans, members of the Church of England. And they wanted to worship in a church. By 1685, decades of tension between various English kings and the Massachusetts Puritans erupted. King James II revoked the colony's self-governance charter, and in 1686 appointed devout Anglican Sir Edmond Andros as Royal Governor and mandated him to maintain control over the colony. Royal Governor Andros demanded that Anglican services be held in Boston and organized a congregation as soon as he arrived in Boston in 1686, ordering the Boston Puritans sell land to them for a church. The Puritans refused - so Royal Governor Andros seized land from a corner of the town's first burying ground, considered sacred because it contained the remains of the first generation of Puritans. Governor Andros had the remains of those buried in "his" corner disinterred and redeposited elsewhere. On this "repurposed" land, he built a small wooden chapel with a steeple - King's Chapel, as the Puritans called it, with the remains of the burying ground next door eventually becoming known as King's Chapel Burying Ground (a fascinating spot to visit along the Freedom Trail due to all the old 17th century gravestones). King's Chapel - no steeple! On his purloined land, Andros built a small wooden chapel with a steeple - King's Chapel, as the Puritans called it, with the remains of the burying ground next door eventually becoming known as King's Chapel Burying Ground, another Freedom Trail attraction due to all the old 17th century gravestones. Before Andros could set foot in his chapel, the Colonists discovered in early 1689 that James II had been overthrown a couple of months earlier. They immediately imprisoned Andros and finally shipped him back to England. Throughout the next half century, Royal officials continued to worship there. In 1713, the Chapel became the first church in New England to acquire an organ. In 1748, Royalists tore down the original wooden chapel and began to build a larger, better version from local Quincy granite. As Royal Governor William Shirley laid the cornerstone, angry Puritans threw garbage at him - until he gave the workmen 20 pounds to drink to his health. Five years later, builders completed the Georgian-style building you can see today (if you peer behind the columns, a later addition). A bell forged in England was hung in 1772. However, the tall steeple envisioned by the Anglican planners fell victim to lack of funds - much to the delight of the Puritans. During the Revolution, Bostonians tried to rename King's Chapel Stone Chapel . . . but that name didn't stick. Then in 1782, the congregation hired James Freeman, first as lay reader and later as minister. He introduced Unitarian ideas and revised the Anglican Book of Common Prayer to embrace Unitarian principles. Although Reverend Freeman still regarded the church as Episcopalian, the Anglican bishop refused to ordain him - so in 1787, New England's first Anglican/Episcopalian church morphed into the first Unitarian church in the United States. As part of the broad community support for this move, George Washington attended a musical performance/fundraiser in 1789 and contributed 5 pounds to build the Ionic columns that you can see today. Although they are designed to look like granite, they're actually made from wood. 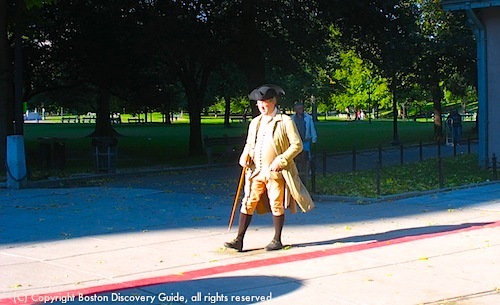 After the chapel's English bell cracked, Paul Revere recast it in his foundry in 1814. When it was rehung in 1816, he called it "the sweetest bell I ever made." This same bell tolled for Paul Revere when he died two years later. And Paul Revere's bell continues to call the congregation to worship each Sunday morning. 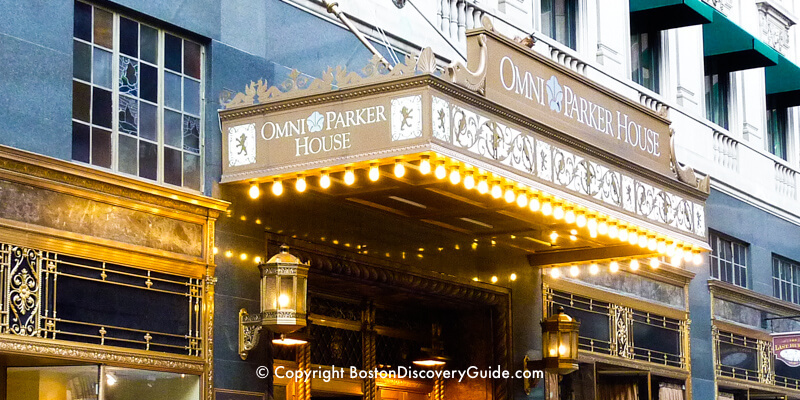 You'll hear its melodic tones in this part of Historic Boston if you're nearby.